Ever the chameleon, Steve Buscemi wrote, directed, and starred in this English-language adaptation of a work by the late Dutch filmmaker Theo Van Gogh. Playing off the eternally underrated Sienna Miller, Interview is essentially a psychological drama in which Buscemi’s Pierre Peders (a journalist who’d rather be anywhere else) is takes with a feature on Miller’s Katya, a tabloid-magnet/actress. Miller, playing a version of herself, is a revelation, while Buscemi turns in one of his typically twisted and brilliant performances. 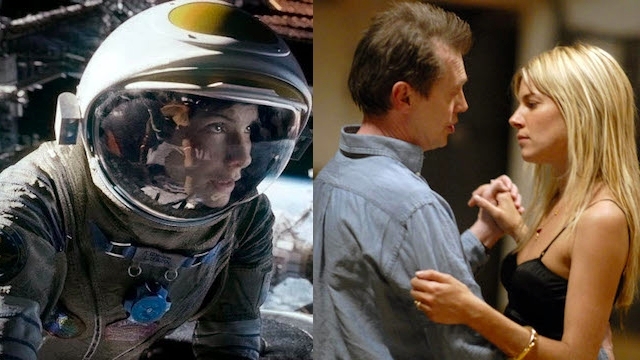 Gravity is first and foremost a moviemaker’s movie. As thrilling, and well-acted as it is (and it is! Sandra Bullock is doing the best work of her career! ), it’s primarily notable for its technique—which is not a surprise coming from the insanely talented Alfonso Cuarón. The man who brought you the heartstopping tracking sequences in Children of Men has brought his unparalelled auteurship to the unforgiving environment of space in this Oscar-nominated marvel. It may lose something in its transition to the small screen (the movie theater allows for a more immersive experience), but any film-lover worth his salt would be remiss not to see it. Leah E. Friedman is the managing editor of AllMovie. She’s seen Starship Troopers in whole or in part more than 50 times.